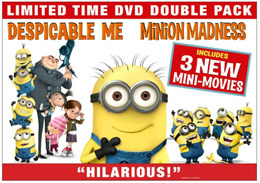 On Dec. 14, 2010, Universal Studios Home Entertainment released the animated family comedy Despicable Me in a variety of different formats: a three-disc Blu-ray/DVD combo , a four-disc Blu-ray 3D / DVD combo pack, a single DVD and a Minion Madness Double Pack with three mini movies featuring the movie’s already-legendary Minion characters. Both of the Blu-ray sets include a digital copy. The Minions mini movies also are on the Blu-ray releases but not the single DVD. The Blu-ray 3D/DVD version also includes the movie in 2D. 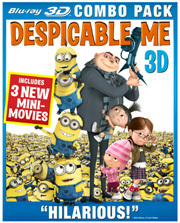 The release of a 3D edition of Despicable Me the same day the movie debuts on other formats marks the second time a Blu-ray 3D title bowed simultaneously with DVD. The first film was Warner Home Video’s Cats & Dogs: The Revenge of Kitty Galore, which hit streets on Nov. 16, 2010. A number of catalog movies have been released on Blu-ray 3D as well, including Sony Pictures Home Entertainment’s Cloudy With a Chance of Meatballs and Open Season and Warner’s Clash of the Titans and The Polar Express. According to Hollywood in HiDef, Walt Disney Studios Home Entertainment also is prepping Beauty and the Beast for Blu-ray 3D. The animated movie comes to Blu-ray on Oct. 5. And Disney bowed its first Blu-ray 3D movie, Jim Carrey’s A Christmas Carol , on Nov. 16, 2010. LucasFilm is converting the Star Wars movies to 3D, with an expected theatrical release in 2012. No news on a Blu-ray 3D release yet. Despicable Me, which tells the tale of a subterranean super-villain wannabe (voiced by Steve Carell of TV’s The Office) whose plot to steal the moon is undone by three precocious orphaned girls, rang up nearly $244 million at the domestic box office this summer. Other voices in the film include Kristen Wiig (Whip It), Miranda Cosgrove (TV’s iCarly), Danny McBride (Tropic Thunder), Jason Segel (Forgetting Sarah Marshall), Russell Brand (Get Him to the Greek), Jack McBrayer (TV’s 30 Rock) and Julie Andrews (Mary Poppins). “The Voices of Despicable Me” behind-the-scenes with Steve Carell, Jason Segel, Russell Brand, Miranda Cosgrove, Kristen Wiig and Julie Andrews as they give life to their animated characters. Includes character profiles for each of the cast members. “Super Silly Fun Land,” in which viewers can join Agnes, Margo and Edith at the Super Silly Fun Land Theme Park and play Feed the Creatures and Freeze the Floating Minions to win prizes. Minion Me: Exclusively for iPhone and iPad: Personalize photos of friends and family by turning them into Minions. Pictures can be customized with glasses, bowties, hats and hairstyles and send to friends with a Minion laugh. Minion Dominion App: Exclusively for iPhone and iPad Control a Minion by turning, tilting, rotating and shaking your phone. Tap the screen to make him speak, tap it again to hear him laugh. Or do battle with the two-player “minion mash up.” Download to an iPhone and see who can inflict the most damage on the other’s minion. 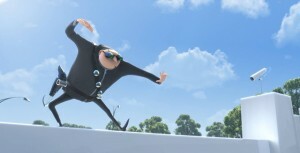 “Gru’s Rocket Builder” game in which Vector has stolen some of the most famous landmarks from around the world and replaced them with the pieces to Gru’s rocket. Players must return all the stolen landmarks to the correct countries in order to build their own rockets before Vector hacks into the system and steals the rocket plans. The reward for completing the rocket is a launch to the moon. “A Global Effort” about the global effort behind Despicable Me. A director from France and another from the U.S., plus an American and English cast created a movie in France, with artists from all over the world for a truly international movie.